“Come and give it a try!” say team captains Buster and Annette Broadnax of the Beckley Buddy Walk®. Now in their 3rd year of being involved with the walk in Beckley, Buster and Annette feel the event has had a tremendous impact on their family, and their son Harrison, who has Down syndrome. Harrison is an energetic 14-year-old who enjoys music (especially Pitbull) and athletics. He also loves the Buddy Walk®, he even wore a past event t-shirt to a recent committee meeting to show his support! “Harrison just has a ball at the walk; he loves the music and dancing!” they share. For Buster and Annette, they look forward to seeing friends, parents of other children with Down syndrome who they can talk about goals with, celebrate milestones and understand the challenges each other may be facing. It’s a real “comradery of families.” Buster and Annette also feel that parents learn important information at the walk about opportunities for their kids, from Special Olympics teams to brochures about specific kinds of glasses, to recommendations for doctors and therapists. The feeling of community and having someone else who “gets it” is invaluable. The couple’s favorite walk memory was Harrison’s first one, where he got his face painted. “Harrison wouldn’t let anyone paint his face before the Buddy Walk®.” Seeing the kids’ faces light up as they enjoy the day together “gives you a good feeling” and the opportunity for “parents to relax a little bit and watch all of the kids interact together.” Each year, Buster and Annette form Team Harrison’s Heroes for the walk. Last year, the team raised $800 through the support of friends and family members who rallied together for Harrison. Annette really enjoys the ease of creating and sharing a team page on Stride, the online fundraising site for the walk. “It has helped so much!” Annette is originally from Connecticut and now her family can be involved through online donations. 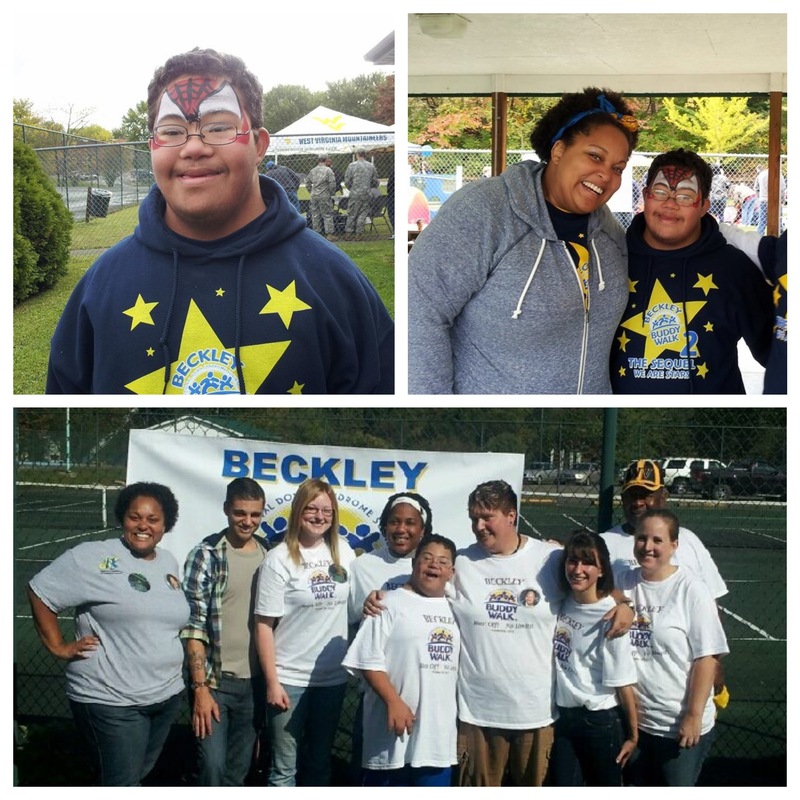 The Beckley Buddy Walk® team hopes to raise $15,000 this year to continue to fund important programs like the Yes I Can (dance, yoga, and swim) classes, a Five Star Play Lab for kids with special needs to play indoors with the help of therapists, sensory movie showings, and awareness initiatives. An ongoing project for a sensory playground is being planned right in New River Park as a place for kids with special needs to play and for their families to have get-togethers; proceeds from the Beckley Buddy Walk® will help fund this project. To show your support for the walk, please visit the Beckley Buddy Walk® fundraising site at http://www.ds-stride.org/beckleybuddywalk. To learn more about the Down Syndrome Support Group of Southern West Virginia, please visit https://downwiththat.wordpress.com/.